SEMANTIC TOOLS FOR CARBON REDUCTION IN URBAN PLANNING Co-funded by the European Commission within the 7th Framework Programme Ontology mapping tool Presentation | Report The purpose of the ontology mappings tools is to help users –domain experts, data owners and ontology engineers– to integrate data sources into the semantic energy information framework (SEIF). It supports some steps of a semantic integration process, particularly the creation of the R2RML mapping file. 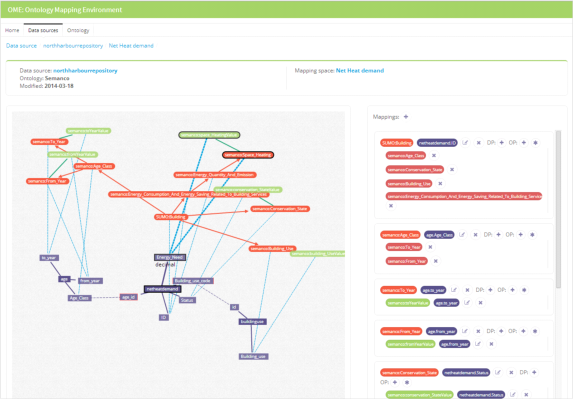 The ontology mapping tool can read a database structure by reading a SQL schema and provides a web interface based on graph visualizations to let users to map the database structure to the target ontology. The output of the tool is a R2RML file where the URI (i.e. subjectMap and objectMap) and SQL (i.e. sqlQuery) are generated automatically, however the user can customize them. It is a generic tool which can hold any OWL ontology.